The Tyler Mire Big Band is a cutting edge modern big band comprised of the finest musicians in Nashville, TN. 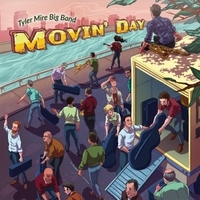 Movin’ Day is the second release by the Tyler Mire Big Band. Since moving to Nashville, TN in August 2013, Mire has assembled a new ensemble comprised of the region’s top studio and jazz musicians. The band plays with a common purpose to move the music forward while keeping one foot firmly in the tradition. The project pays attention to dynamics, phrasing, nuance, and improvisation at levels not heard often in big band jazz. Highlights from the recording include “New Nashville” a hip hop shuffle which features Doug Moffet and Oscar Utterstrom, “Action Jackson and the Magical Disappearing Sock” a quirky blues that features a virtuosic five part clarinet soli. The ethereal tour-de-force “Spy Eyes” features flutist Daniel Pardo and saxophonist Jeff Coffin of Dave Matthews Band. “Thoughts” an emotional ballad that goes up-tempo features the artistry of Evan Cobb on tenor saxophone. Throughout the recording, Mire showcases his band’s versatility with a multitude of feels, grooves and moods. Listeners may be struck at the huge variety and depth of the project that is a result of the rich musical heritage of Nashville. "A Classic For You to 'Add'-Mire!" The collective structure and instrumentation of the ensemble known as a “big band” hasn’t radically changed for decades. However, whether it is nine brass, five woodwinds and a rhythm section or some permutation thereof, the modern day big band arranger, like a FINALE-armed, ersatz Hercules, faces a multitude of challenges. He or she must simultaneously engineer things to generate a listener’s interest and emotional involvement, as well as provide a performing environment that challenges, stimulates and frames section components and soloists. And, said arranger is expected to do so in the most encouraging and stimulating light. Nashville trumpeter/arranger/composer, Tyler Mire (actually, pronounced “Meer”) represents a brilliant new breed of such arranger. With "Movin’ Day", Mire vividly demonstrates that he has the compositional and arranging chops of a visionary, while simultaneously channeling those ‘ranging Gods on Osmiroid Olympus: (Duke Ellington, Thad Jones, Gerald Wilson, Patrick Williams, Oliver Nelson and the “Bestico,” Sammy Nestico – all of which are shaded by Mire). Further, with ultimate respect for his musicians, Mire’s genre-diverse material is melodically, rhythmically and structurally complex. Thus his work, as one hears here, demands the best from the best – and they deliver. Mire’s ensemble is comprised of Music City’s finest musicians. They shine bright covering Mire’s exceptional material – which floats across a spectrum of genre from Rock-ish jazz (“New Nashville”), Latin (“Vibes”) to classic atomic Count Basie (“Movin’ Day,”), exotic Gerald Wilson-esque fare (“Spy Eyes”) and “Mad” Thad (“Swing, Dammit” and “Penny’s Waltz”), and even a hair of Music City (the gorgeous ballad “Sapphire”) impeccably with great energy and involvement. This ensemble spearheaded by lead trumpet, Steve Patrick and an aces rhythm section, swings its juleps off. Shrewdly, Mire’s material offers plenty of spotlight for the outstanding soloists to step into and they all shine. "Movin’ Day" is as “Phat” and terrific a big band recording as it gets. Mire is one very talented young composer/arranger who – if he keeps this terrific quality material coming - might be movin’ one day up on to the “Big Double O” himself.